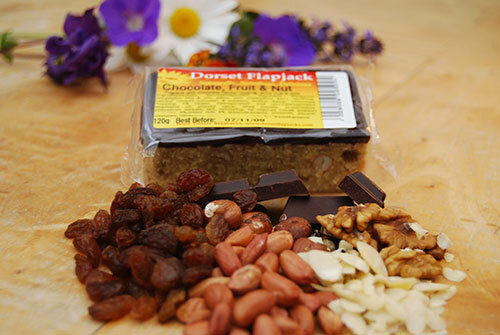 Want to order our mixed box option? Oats, Non-hydrogenated Vegetable Margarine (vegetable oils, water, salt, emulsifier E475, natural colours curcumin & Annatto), Golden Syrup, dried apricots 4%, dried apples 4%. Suitable for Vegetarians. May contain traces of nuts. Oats, Non-hydrogenated Vegetable Margarine (vegetable oils, water, salt, emulsifier E475, natural colours curcumin & Annatto), Golden Syrup, chopped dried apple 4% Sultana 4%, cinnamon. Suitable for Vegetarians. May contain traces of nuts. Oats, Non-hydrogenated Vegetable Margarine (vegetable oils, water, salt, emulsifier E475, natural colours curcumin & Annatto) Golden Syrup, Glace Cherries 4% (glucose syrup, citric acid, preservative potasium sorbate, colour erythrosine) Raspberry Preserve (sugar, raspberry pulp, citric acid, pectin, preservative potassium sorbate, colour anthocyanin, natural flavour), almond essence. Suitable for Vegetarians. May contain traces of nuts. Oats, Non-hydrogenated Vegetable Margarine (vegetable oils, water, salt, emulsifier E475, natural colours curcumin & Annatto), Golden Syrup, Toffee Topping 5% Sugar, Glucose Syrup, Vegetable Oil, Water, Whey Powder (from milk), Flavouring, Emulsifiers (E471, E492), Colour (E150c), Preservative (E202), Citric acid, Salt. Banana Chips 3%, Banana essence (emulsifiers pectin, citric acid). Suitable for Vegetarians. Contains Milk products. May contain traces of nuts. 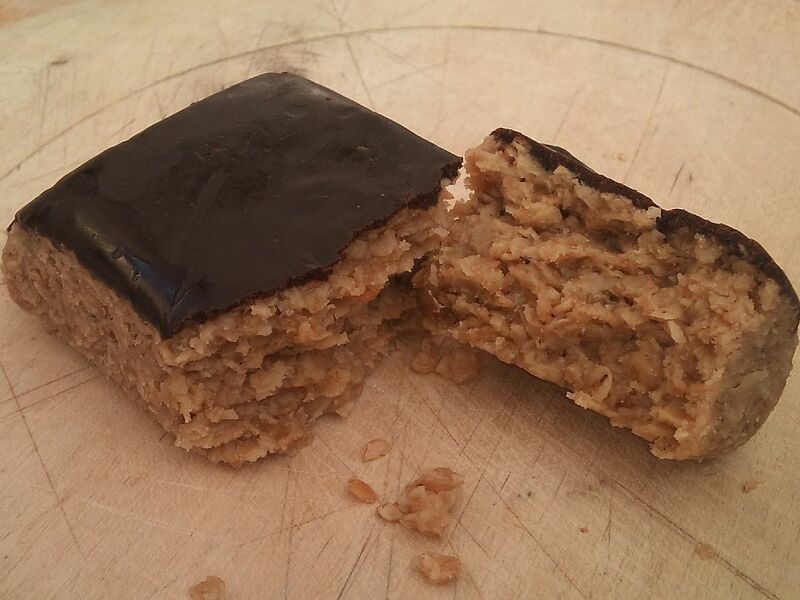 Flapjack with coffee flavoured topping. Oats, Non-hydrogenated Vegetable Margarine (vegetable oils, water, salt, emulsifier E475, natural colours curcumin & Annatto), Golden Syrup, Coffee Topping 5% Sugar, Glucose Syrup, Vegetable Oil, Water, Skimmed Milk Powder, Flavouring, Emulsifier (E471, E492), Salt, Preservative (E202), Colour (E150c) White Chocolate Flake. Suitable for Vegetarians. Contains Milk products. May contain traces of nuts. Oats, Non-hydrogenated Vegetable Margarine (vegetable oils, water, salt, emulsifier E475, natural colours curcumin & Annatto), Golden Syrup, Chocolate & Caramel Topping 7% Sugar, Vegetable Oil, Glucose Syrup, Fat Reduced Cocoa Powder, Water, Humectant (Sorbitol), Whey Powder (from milk), Emulsifiers (E471, E492), Colour (E150c), Preservative (E202), Citric acid, Salt, Flavouring. Suitable for Vegetarians. Contains Milk products. May contain traces of nuts. Oats, Non-hydrogenated Vegetable Margarine (vegetable oils, water, salt, emulsifier E475, natural colours curcumin & Annatto), Golden Syrup, Glace Cherries 5% (glucose syrup, citric acid, preservative potasium sorbate, colour erythrosine), desiccated Coconut 4%. Suitable for Vegetarians. May contain traces of nuts or cherry stones. Oats, Non-hydrogenated Vegetable Margarine (vegetable oils, water, salt, emulsifier E475, natural colours curcumin & Annatto), Golden Syrup, Glace Cherries 5% (glucose syrup, citric acid, preservative potasium sorbate, colour erythrosine) Sultanas 3%. May contain pieces of Cherry stone. Suitable for Vegetarians. May contain traces of nuts or cherry stones. 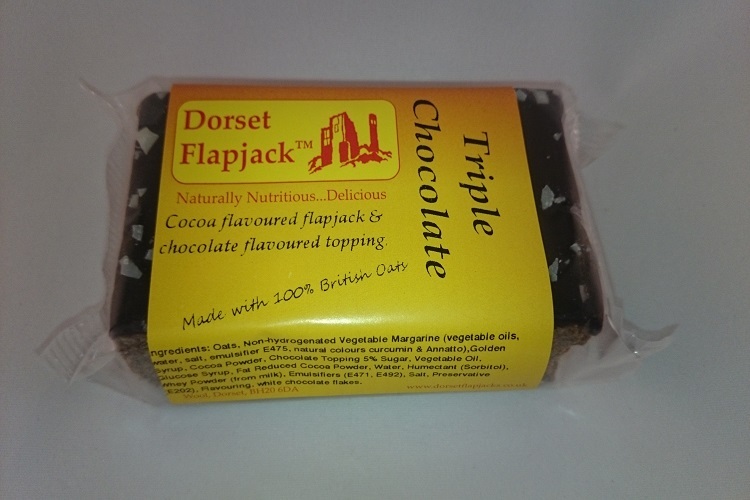 Flapjack with a chocolate flavoured topping. Oats, Non-hydrogenated Vegetable Margarine (vegetable oils, water, salt, emulsifier E475, natural colours curcumin & Annatto),Golden Syrup, Chocolate Topping 5% Sugar, Vegetable Oil, Glucose Syrup, Fat Reduced Cocoa Powder, Water, Humectant (Sorbitol), Whey Powder (from milk), Emulsifiers (E471, E492), Salt, Preservative (E202), Flavouring. Suitable for Vegetarians. Contains Milk products. May contain traces of nuts. Oats, Non-hydrogenated Vegetable Margarine (vegetable oils, water, salt, emulsifier E475, natural colours curcumin & Annatto), Golden Syrup, Chocolate Topping 5% Sugar, Vegetable Oil, Glucose Syrup, Fat Reduced Cocoa Powder, Water, Humectant (Sorbitol), Whey Powder (from milk), Emulsifiers (E471, E492), Salt, Preservative (E202), Flavouring. sultanas 3%,mixed nuts 2% (peanuts,brazils, almonds, pecans, cashews, hazelnuts, walnuts). Suitable for Vegetarians. Contains Milk products. Contains nuts. 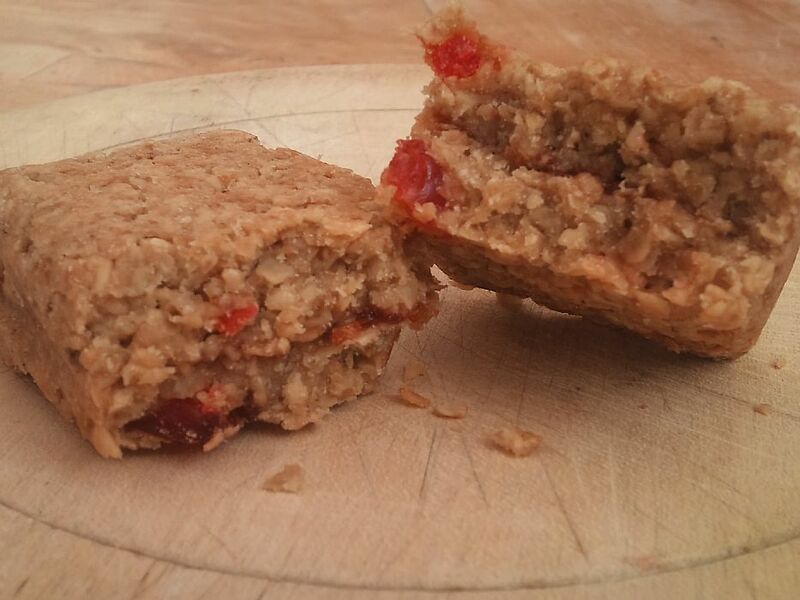 Oats, Non-hydrogenated Vegetable Margarine (vegetable oils, water, salt, emulsifier E475, natural colours curcumin & Annatto), Golden Syrup, Glace Cherries 3% (glucose syrup, citric acid, preservative potasium sorbate, colour erythrosine) sultanas 3%, dried banana 2% dried apricots 2%. Suitable for Vegetarians. May contain traces of nuts. Oats, Non-hydrogenated Vegetable Margarine (vegetable oils, water, salt, emulsifier E475, natural colours curcumin & Annatto), Golden Syrup, Raspberry Preserve (sugar, raspberry pulp, citric acid, pectin, preservative potassium sorbate, colour anthocyanin, natural flavour). Suitable for Vegetarians. May contain traces of nuts. Oats, Non-hydrogenated Vegetable Margarine (vegetable oils, water, salt, emulsifier E475, natural colours curcumin & Annatto), Golden Syrup, Toffee Topping 5% Sugar, Glucose Syrup, Vegetable Oil, Water, Whey Powder (from milk), Flavouring, Emulsifiers (E471, E492), Colour (E150c), Preservative (E202), Citric acid, Salt. Suitable for Vegetarians. Contains Milk products. May contain traces of nuts. Oats 60%, Non-hydrogenated Vegetable Margarine (vegetable oils, water, salt, emulsifier E475, natural colours curcumin & Annatto), Golden Syrup 15%. Suitable for Vegetarians. May contain traces of nuts. Oats, Non-hydrogenated Vegetable Margarine (vegetable oils, water, salt, emulsifier E475, natural colours curcumin & Annatto),Golden Syrup, Cocoa Powder, Chocolate Topping 5% Sugar, Vegetable Oil, Glucose Syrup, Fat Reduced Cocoa Powder, Water, Humectant (Sorbitol), Whey Powder (from milk), Emulsifiers (E471, E492), Salt, Preservative (E202), Flavouring. white chocolate flakes. Suitable for Vegetarians. Contains Milk products. May contain traces of nuts. Flapjack with vanilla flavoured topping & caramel flavoured fudge. Oats, Non-hydrogenated Vegetable Margarine (vegetable oils, water, salt, emulsifier E475, natural colours curcumin & Annatto),Golden Syrup, Vanilla Topping 5% (Sugar, Vegetable Oil, Glucose Syrup, Water, Skimmed Milk Powder, Emulsifiers (E471, E492), Colour (E171), Salt, Preservative (E202), Flavouring). Fudge cubes 3% (sugar, condensed milk, glucose, NH vegetable fat, lecithin), Dark Chocolate flakes. Suitable for Vegetarians. Contains Milk products. May contain traces of nuts. Oats, Non-hydrogenated Vegetable Margarine (vegetable oils, water, salt, emulsifier E475, natural colours curcumin & Annatto), Golden Syrup, White Chocolate Flavoured Topping 6% Sugar, Vegetable Oil, Glucose Syrup, Water, Skimmed Milk Powder, Whey powder, Emulsifiers (E471, E492, E322), Colour (E171), Salt, Preservative (E202), Flavouring. Dark Chocolate flakes. Suitable for Vegetarians. Contains Milk and Soya. May contain traces of nuts. Oats, Non-hydrogenated Vegetable Margarine (vegetable oils, water, salt, emulsifier E475, natural colours curcumin & Annatto),Golden Syrup, Yoghurt Flavour Topping 6% Sugar, Vegetable Oil, Glucose Syrup, Water, Skim milk Powder, Whey powder, Emulsifiers (E471, E492, E322), Colour (E171), Salt, Preservative (E202), Flavouring, Yoghurt powder, wheat flour. Suitable for Vegetarians. Contains Milk products. May contain traces of nuts.